Have you always had the urge to serve and protect your community? Well, don’t waste your time applying to the police academy. It can be such a hassle and take forever to finally get out on the streets! 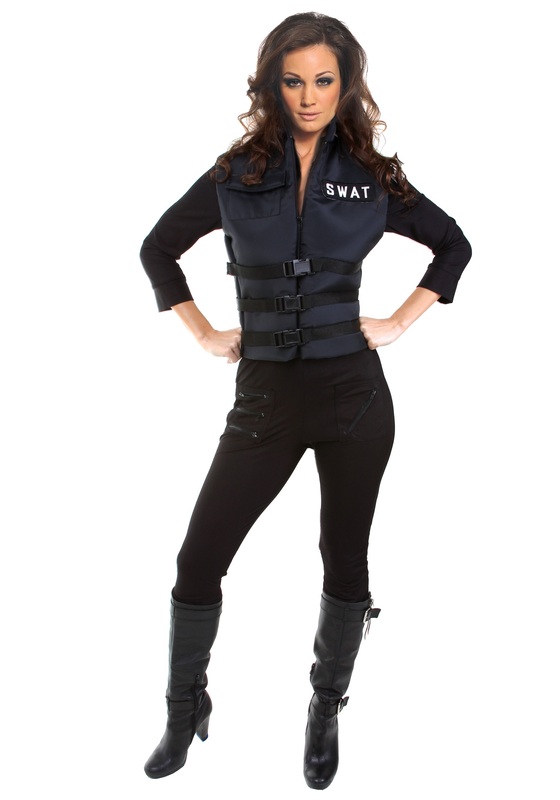 No, instead grab this awesome SWAT Girl Costume and start regulating the fun at costume parties this Halloween! Burst into the party scene and let everyone know who's in charge of getting the party started! Grab a handful of friends and you could all be a part of an elite squadron of party experts. It will be your jobs to make sure that every buzz kill is taken care of immediately and that everyone follows the rules. What are the rules you ask? Well, the three big ones are easy to remember: The music has to be bumping, the dance floor has to be hopping, and people have to use coasters. We're not into littering or water rings left on an unsuspecting coffee table! So, if you think you can handle that kind of responsibility, then it’s time to slip into this sassy black jumpsuit and get to work! This costume includes a snug jumpsuit with a zip vest that says SWAT on it. The buckles fasten in the front give it a realistic look, and the handy pockets along the thighs will hold all the little things you need. If you really strive to be the best of the best then you need to make sure you accessorize. You’ll want a pair of black boots that are both stunning and ready for some running. Also, you can’t go wrong with one of our SWAT helmets. Once you strap up your boots and buckle your chinstrap you’ll look cuter than ever and be fully prepared to ensure a fun and safe Halloween for everyone!